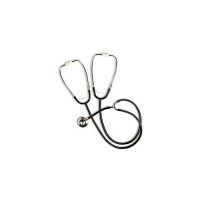 A major breakthrough in auscultation training! The instructor selects from a menu of heart and lung conditions by wireless remote control. The manikin presents itself as a real patient without visible auscultation sites. 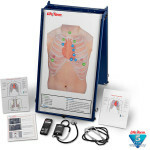 The student must palpate to identify correct auscultation locations, and will hear different heart and lung sounds as the Smartscope is moved to different locations on the manikin. A diagnosis of the condition selected by the instructor can be made by comparing the variations in sounds occurring at different sites. Just like a real patient! Lung sounds can be detected on the posterior surface and students can practice auscultation at seven anterior heart sites. 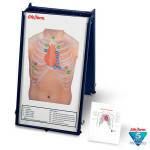 The remote control does not have to be pointed at the manikin or stethoscope to operate. One remote control will operate multiple sets of Smartscopes and manikins simultaneously. Great for group instruction. Range on the unit is up to 100 feet of remote access. 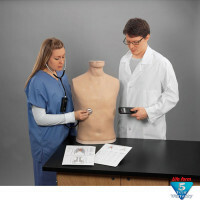 Auscultation trainer includes manikin, one remote control with LCD display, and one Smartscope with single- and dual-user headpieces. Operates using three "AAA" batteries (included). 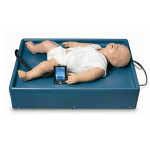 Additional Body for Life/form Ausculation Trainer - LF01145U.